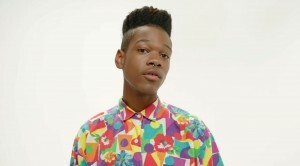 This is Shamir. He’s got a fancy-pants shirt. He’s from the US and he’s just 20 years of age. Now watch he slowly morphs into a Muppet in the video for his new single ‘Call It Off’. According to his local label Remote Control, the single deals with the elation we feel from moving on from something that’s been holding us back for too long. The clip was directed by Philip Hodges for the YouTube Music Awards and given Philip has an association with the iconic Jim Henson studios – creator of ‘The Muppets’ and ‘Sesame Street’ – a puppet in the likeness of Shamir was a no-brainer. But the way he’s incorporated it into the clip with the singer (who plays a shop assistant) is rather ingenious. Couple that with addictive future-disco beats, a splash of rap and Shamir’s almost-falsetto tones in the chorus and you’ve got a myriad reasons to be excited for the release of his album ‘Ratchet’ in Australia on Friday May 15.